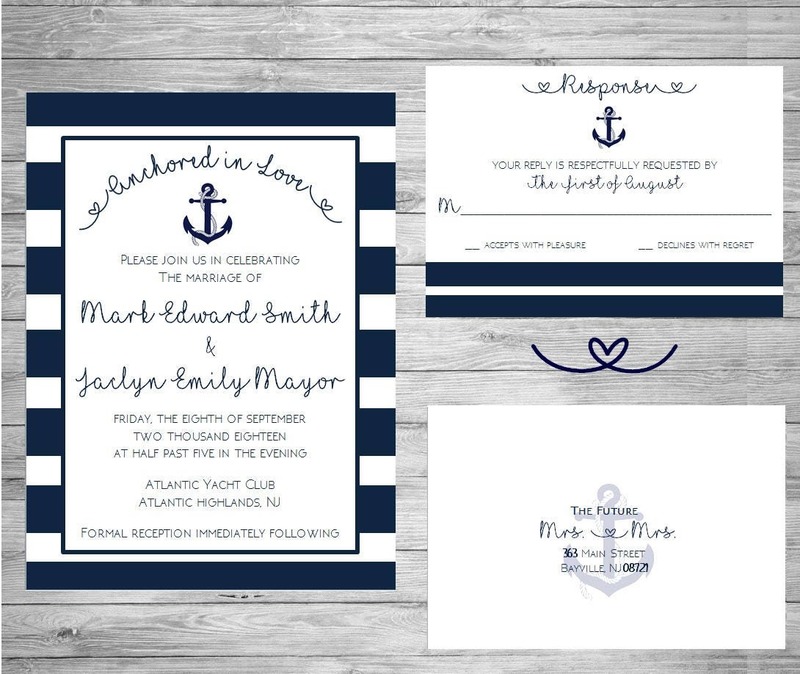 If you are anchored in love and having a nautical themed wedding, this invitation is perfect for you! The wording on this invitation can also be customized for any event. We will create your personalized invitation in a high-resolution PDF in a 5x7 and 3.5 x 5 RSVP card which will then be emailed to you. You can then email or print as many copies as you need. When purchasing this listing through Etsy, please include the following information in the "notes to seller". If you need additional inserts, i.e., reception, accommodation please let us know. Each additional pdf is $10.00. You may also give us the wording as you would like it printed! You do not need to use the wording in the photo. Our current turnaround time is 24-48 business HOURS. Once we have received all your information, we will customize your invitation and will email the finished JPEG to the email you use to log in to Etsy. If you are satisfied with the design, you are ready to print. Otherwise, you can receive one additional revision at no additional charge. A $15 fee applies to any further revisions, or if you would like a size change AFTER we have emailed you the finished PDF.